Zhangjiajie National Park in Hunan Province, China is one of the most striking places I have been. Due to some wonderful and ancient Chinese political intrigue, a man name Zhang Liang fled to this remote area and settled here because of the ethereal beauty and tranquility of the mountains. 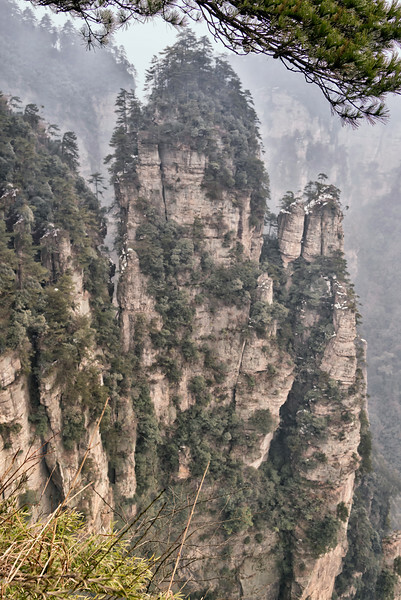 The name Zhangjiajie means Zhang family (jia) homeland (jie). you can read more about its history and the importance of this place here: http://www.zhangjiajietourism.us/about-history.html . I was lucky to visit it on a cold late January morning in 2016 and made these photographs. I wasn’t smart enough to get crampons & spent quite a bit of time sliding around on the trail at a height of around 1000 meters. Those of you in Colorado and Tibet won’t see this as such a great height, but it was clearly enough for me. Oh yeah, and there were monkeys. I’ll be back in the spring as I have a resort project under development here and I hope to return throughout the year to capture the changes the seasons bring. More to come.